Senators who dumped the All Progressives Congress for the Peoples Democratic Party have dared the lawmaker representing Katsina South Senatorial District, Senator Abu Ibrahim, to do his worst over Saraki’s defection. 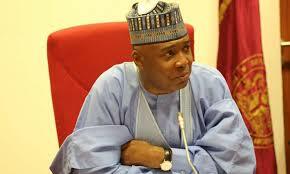 Two of the 14 senators who have defected from the ruling APC to the opposition party, Senator Isa Misau (Bauchi-Central) and Senator Rafiu Ibrahim (Kwara-South), in a statement they jointly issued on Saturday, warned the Katsina senator and “his fellow travellers” in the APC not to foment any trouble when the Senate resumes on September 25. Ibrahim is a member of the Parliamentary Support Group, a group of APC senators loyal to President Muhammadu Buhari, while Misau and Rafiu Ibrahim are known allies of Saraki. The lawmakers said, “It is obvious from the statements of Abu Ibrahim that he and his cohorts are not democrats. They do not believe in the rule of law, the provisions of the constitution, the Standing Order of the Senate, parliamentary procedure and the due process. Misau and Ibrahim asked APC senators to note that they were now the minority party. The statement partly read, “The PDP has more members. When we resume, if they push us, we will move for a headcount of members and change some of our principal officers to reflect party strength. “Today, by the list paraded by the APC, they have only 48 senators and the PDP has 54, APGA has 2 and ADC has 2. There are two vacancies. That is the distribution in the Senate. Let them continue to deceive themselves,” the lawmakers stated. “Our colleague from Katsina State has equally demonstrated that even though he has spent four terms in the legislature, he has not imbibed parliamentary ethos. Even his knowledge of the provisions of the law and the Senate rules is suspect. That is why he misrepresented the provisions of Rule 12 Orders 1, 2 and 3 of the Senate about the process of reconvening the Senate after it properly adjourned. “By the provision, without all the leaders of the four parties initiating the reconvening of the Senate before the adjourned date, nothing can legally happen. Also, without the consent of the Senate President, nothing can happen. The lawmakers said they were surprised that the defection was making the APC so uncomfortable that it was ready to bring the country down because some senators left the ruling party.